It is no secret that kids love sugar. It is also no secret that consuming too many foods and beverages with added sugar can cause an array of health problems including tooth decay, obesity, nutrition deficiencies and a mantra of other cognitive affects. Recent talk about sugar and its association with these health concerns has gained quite a bit of momentum over the past couple of years. To make matters worse, it appears that the world rains sugar on children. Bus drivers offer bubble gum; teachers give cupcakes at birthday parties, and school vending machines are filled withed sugar laden products. It has been proven that obesity is a problem in our country whereas approximately 1/3 of all children are either overweight or obese. A common practice in attempt to reduce sugar consumption has been to use sweeteners also known as artificial sweeteners or sugar substitutes instead. 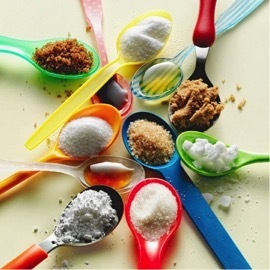 Today, an array of sweeteners is found in a variety of food and beverages and is typically marketed as “sugar-free” or “diet”. As parents, caretakers, and healthcare professionals, it’s important that we have a better understanding as to the impact that high levels of sugar can have our children’s health. It is also equally important to understand what these sweeteners are and what roles they play in our diet. Do they provide a healthier alternative to sugar? Is all sugar bad? Sugar is a carbohydrate called sucrose which contains two molecules, glucose and fructose. It can either be found naturally occurring (like in fruit of lactose in milk) or added during food processing such as in breads, cakes, soft drinks, jams and at the table. Added sugars (as opposed to natural sugars) can be harmful because they contribute no real nutritional benefit and when consumed at high levels can add many extra calories. When considered with solid fats and excess energy intake, they have been linked to health concerns including overweight and obesity, type 2 diabetes or prediabetes, inflammation and tooth decay in kids. According to the American Dental Association (ADA), tooth decay is the most chronic childhood disease. Added sugars can be identified by reading the ingredient lists on food labels. Cane juice, evaporated corn sweetener, fruit juice concentrate, crystal dextrose, glucose, liquid fructose, sugar can juice and fruit nectar are all examples of added sugars that can often be found in foods but aren’t recognized by the FDA as an ingredient. It is important however to clarify that not al l sugar is bad, it depends on the context. Natural sources of sugar such as that found in fruit not only contains sucrose, but also fiber and water which helps to slow down digestion. Therefore they are much more filling than a 16 oz. Coke for example. 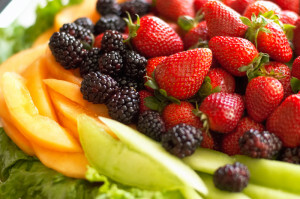 Fruit also contain lots of additional vitamins, minerals, and antioxidants that aren’t found in many products containing added sugars like sugar-sweetened-beverages (SSBs), many snacks, candies, desserts, and pastries that kids are often surrounded by. Therefore, rather than avoiding sugar altogether, natural sources of sugar such as fruit can used as a healthy component to a child’s diet and used to displace foods and beverages with added sugars. Limit portions of cookies, candies and other baked goods. Substitute healthier fruit based desserts instead. Reduce sugary cereals and opt for whole-grain cereals like oatmeal without added sugar. To enhance sweetness, adding fruit, nuts and cinnamon are all healthy ways of jazzing it up a bit. An 8 0z serving of yogurt has approximately 12 grams of natural sugar. However, many flavored yogurts contain added sugars at relatively high amounts. As an alternative, try opting for natural yogurt and add real fruit for sweetness. SSBs should be avoided and rather replaced with water and unflavored milk. Sports drinks, juices and other flavored beverages should be limited. Check the ingredient list on foods that you buy for your child. If you see sugar or high fructose corn syrup near the top of the list, you may want to consider a healthier option. such as the Dietary Guidelines for Americans and the Dietary Reference Intakes, as well as individual health goals and personal preference. Unlike sugar, they don’t cause cavities or add calories to food and they can be a helpful alternative for children with diabetes. More information from the Academy of Nutrition and Dietetics can be found here Position Paper from the Academy. That said there is one group of kids who can’t eat all artificial sweeteners: those with phenylketonuria (or PKU). People with PKU aren’t able to metabolize phenylalanine, an amino acid in aspartame, so they’re advised to steer clear of aspartame. Sweeteners can be grouped as either nutritive (NS) or non nutritive (NNS). Nutritive sweeteners contain carbohydrate and thus energy. They can either impart 4 kcal/g (as in sucrose) or2 kcal/g (as in sugar alcohols). NNS are those that sweeten with minimal or no energy or carbohydrate when ingested. It is included in the ingredient list on the food label as acesulfame K, acesulfame potassium, or Ace-K. Acesulfame potassium is sold under the brand names Sunett® and Sweet One®. It is approved for use in tabletop sweeteners, dry beverage mixes and chewing gum. 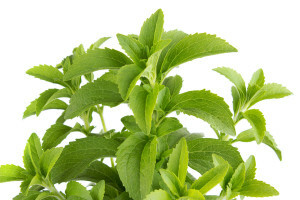 It is about 200 times sweeter than sugar and is often combined with other sweeteners. Aspartame brand names include Nutrasweet®, Equal®, and Sugar Twin®. It does contain calories, however because it is about 200 times sweeter than table sugar, consumers are likely to use much less of it. Soft drinks account for over 70% of the aspartame consumed. Children with phenylketonuria (PKU) have a difficult time metabolizing phenylalanine, a component of aspartame, and should control their intake of aspartame. Labels of aspartame-containing foods and beverages must include a statement that informs individuals with PKU that the product contains phenylalanine. Neotame is sold under the brand name Newtame®, and is approximately 7,000 to 13,000 times sweeter than table sugar. Like aspartame, neotame is amade from aspartic acid and phenylalanine. However, because neotame is not significantly metabolized to phenylalanine there is no warning label required for those with PKU. Saccharin brand names include Sweet and Low®, Sweet Twin®, Sweet’N Low®, and Necta Sweet®. It is 200 to 700 times sweeter than table sugar (sucrose), and it does not contain any calories. Saccharin is currently approved for use, under certain conditions, in beverages, fruit juice drinks, and bases or mixes when prepared for consumption in accordance with directions, as a sugar substitute for cooking or table use, and in processed foods. In the early 1970s, saccharin was linked with the development of bladder cancer in laboratory rats, which led Congress to mandate additional studies of saccharin and the presence of a warning label on saccharin-containing products until such warning could be shown to be unnecessary. In 2000, the National Toxicology Program of the National Institutes of Health concluded that saccharin should be removed from the list of potential carcinogens. Products containing saccharin no longer have to carry the warning label. Sucralose is sold under the brand name Splenda®. Sucralose is about 600 times sweeter than sugar. Luo Han Goa ( Siraitia grosvenorii) is a natural sweetener that contains varying levels of mogrosides, which are the non-nutritive constituents of the fruit primarily responsible for the characteristic sweetness. It is about 150 to 300 times sweeter than table sugar. ia extracts is not considered GRAS and their import into the United States is not permitted for use as sweeteners. Advantame is the most recent addition and was approved for use in food as a non-nutritive sweetener in 2014. It is approximately 20,000 times sweeter than table sugar. It is important to mention however that current research concerning NNS and any respective health benefit is inconclusive. One concern about artificial sweeteners is that they affect the body’s ability to gauge how many calories are being consumed. Some studies show that sugar and artificial sweeteners affect the brain in different ways. The human brain responds to sweetness with signals to eat more. By providing a sweet taste without any calories, however, its thought that artificial sweeteners could potentially cause us to crave more sweet foods and drinks, which can add up to excess calories. Whether or not the sweet taste causes cravings is still being debated. If your child is eating an occasional artificially sweetened food or beverage, it may not be cause for concern. That said, for children, the long-term effects of consuming artificially-sweetened beverages are unknown. It is also important to be mindful that many foods with artificial sweeteners such as sugar free ice cream and fruit flavored drinks aren’t always the most healthful options and can still fill kids up with empty calories. As a more nutritious alternative, try satisfying your child’s sweet tooth naturally by mixing fresh fruit into a creamy low-fat yogurt, slicing bananas on a whole grain waffle, or stirring chopped pears onto a bowl of hot oatmeal. 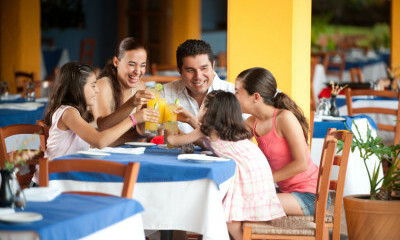 You Can Enjoy Eating Out with Food Allergies- Here’s How! 1) Create your own food allergy card that lists all of your allergens or known sensitivities– This is extremely helpful to both you and the restaurant staff to ensure that you get a meal that will make your stomach happy. When you sit down at the table, let the server know as soon as possible that you have food allergies and present him or her with the card so he or she can make suggestions about what meals to order or what can be modified. If they are not sure, they can take your card to the chef to consult them. This makes it easy for everyone. I do this and I have had many waiters thank me for bringing it with me and some restaurants even asked to keep a copy at the restaurant for when I return. You can make copies of your card to carry with you to give to friends and family members too so they can prepare allergen-free foods for gatherings, birthdays, etc. There are also websites that can make custom allergy cards if you would rather not make one yourself. If you are traveling you can get your card translated into the language of your destination country. Their response will clue you in on the measures the restaurant takes to avoid cross contamination. This will show you how contentious the restaurant is about guests with food allergies. This will ensure that proper measures are taken that the meal is safely prepared. If they say they will not be there when you plan on coming in ask if they can alert someone who will be working at that time. Next you can discuss the menu and the ingredients in dishes that they suggest or you find on the menu online to make sure there are no allergens. Make sure to talk about ingredients in sauces and garnishes. Also discuss cooking methods so you can avoid cross contamination issues. Once you come up with a dish together that sounds tasty write it down so you can request it when you make your visit to the restaurant. 4) Avoid getting anything deep fried – Even if French fries are labeled gluten free in a restaurant, ask the server if they have a dedicated gluten free fryer. If they do then, order the French fries! However if they do not, it is risky because the French fries are most likely in the fryer with breaded gluten-containing foods and can easily get contaminated. 5) Add some flavor by bringing your own condiments- From my experience with food allergies and restaurants, most often there are allergens in the sauces and dips so the dish I order is fairly plain. To make it more exciting, consider bringing small amounts of your favorite flavors with you. For instance, you can bring a container of tamari if you are gluten free and going to a Japanese restaurant that only has soy sauce. Get creative. If you can’t have the dressing on a taco salad, ask for some oil, salsa, or extra avocado or bring your own if you suspect they might have ingredients that your body doesn’t agree with. 6) Always bring food allergy medications just in case- If you have severe allergic reactions to foods, don’t leave without your EpiPen, antihistamine or any other medications you need to get things under control should you have an unexpected reaction. Better safe than sorry! Use this application to find gluten free restaurants near you. It uses GPS to help find places to eat nearby, especially if you are somewhere unfamiliar. Even if you have additional food allergies this is a good application to use to get a sense of how conscientious restaurants are about allergens. You can see ratings and reviews from others and add your own. This application also helps guide you to local restaurants that serve food that is free of your allergens. Learn about the latest food allergy research, hear stories from others and find lots of information about managing your food allergies in every aspect of your life, and more on this site. 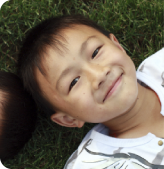 You can also connect to food allergy related events here. This site shows restaurants that are committed to being 100% gluten free facilities across the country. This is one site where you can purchase custom food allergy cards that are translated into foreign languages to take traveling. The cards cost $8 and are custom so you can add up to 10 allergens on them. When I was diagnosed with dairy, gluten, and basil allergies one of my first thoughts was “bye-bye pizza”, which was very sad to me. However, when I went to Razzi’s I found that was absolutely not true. They have the most extensive vegan and gluten free Italian menu I have ever seen. Also the owner is very gracious and dedicated to his business. He told me if I let them know a few days in advance they will prepare a pizza sauce without basil and they also asked to keep my food allergy card. Not only are they extremely kind, but their food is also incredible! This is certified gluten free bakery, which means their facility is audited by the Gluten-Free Certification Organization (GFCO) every year and they test their ingredients for gluten 4 times a year. They make amazing gluten free and vegan cookies, scones, muffins, you name it. They also have coffee, tea and some lunch items. My top picks are their ginger wheel cookies and dark chocolate muffins. Can you say moist! With a completely gluten free menu and one of the country’s largest selections of hard ciders, what is not to love? I have had many wonderful dining experiences here with beautiful food. Another perk is that they have a dedicated gluten free fryer so this is one of the only places where I indulge in fresh fish and chips. Yum!